Many individuals experience stomach pain such as abdominal cramping and bloating, after eating a meal that includes dairy products. Depending on the type of dairy ingested and the amount, this stomach pain can also be accompanied by constipation, diarrhoea, and excess gas. The first step in finding relief from dairy related stomach pain is understanding the cause of the pain itself. Stomach pain can result after the consumption of dairy products in individuals who are allergic to milk or in those who have intolerance to lactose. Of the two causes, milk allergies are less common. A true milk allergy, meaning the individuals is allergic to milk, is actually an allergy to the protein found in cow's milk. This condition is usually genetic and the symptoms are most noticeable after the ingestion of milk, yoghurt, and cheese. Lactose intolerance, on the hand, is a far more common aliment and is caused by the lack of a certain enzyme in the body. Individuals who are lactose intolerant do not produce enough lactase in the small intestine to digest the sugar most abundant in milk products. When the body can not process this sugar, lactose, it can not convert the sugar into glucose and galactose, which are the simpler forms of sugar that are readily absorbed by the bloodstream. Symptoms of lactose intolerance usually begin about one to two hours after the consumption of dairy products. The onset, severity, and duration of the symptoms depend on the individual's degree of lactose intolerance, on the amount of dairy food ingested, and sometimes on the specific type of dairy. Since stomach pain can be caused by other factors than the ingestion of diary products it is a good idea to test your tolerance to these products before changing your diet or avoiding your favourite foods. In order to get the most accurate results you will need to eliminate all dairy products, such as cow's milk, cheese, butter, yoghurt, salad dressings, and ice cream, from your diet for a t least one week. Beginning the following week you will reintroduce just one dairy product, such as cow's milk, into your diet just once a day. Make sure that you note which dairy product you tried, the amount, and the time of day that you ingested it. For the best results you should track your results in a journal for the duration of the experiment. Remember to record any symptoms you experience after ingesting the test food and also jot down when the symptoms started, how long they lasted, and how severe they were. After two or three days of following this plan switch the dairy product to another type and record those results. In two weeks you should have a clear picture as to whether dairy products are the cause of your stomach pain or not. If they are, there are a few simple changes you can make to diet to control your stomach pain. The symptoms of lactose intolerance can be eliminated if you avoid the ingestion of lactose. 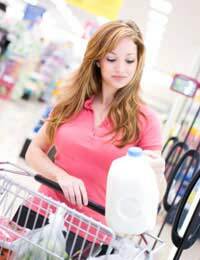 Most supermarkets offer reduced lactose milk and other dairy products. You can also take a lactase supplement, which is readily available over-the-counter, prior to consuming products that contain lactose. Finally, you can try eating some dairy products, such as cheese and ice cream, in very small amounts and along with a non-dairy food to curb the onset of symptoms. If you find that you need to avoid lactose-containing products altogether you will need to cut more than just dairy products from your diet. Many foods that are labelled non-dairy, such as whipped topping and powered creamers, and some prepared foods, such as breakfast cereals, breads, instant potatoes, and mixes for cookies, pancakes, and biscuits, contain ingredients derived from dairy products. These products can cause the same symptoms in lactose-intolerant individuals as straight cow's milk.